When I first studied the Gospels, I noticed what most everyone does — Matthew, Mark, and Luke are pretty similar, while John deviates wildly from the other three. This is well-known, and it’s the reason Matthew, Mark, and Luke are collectively known as the Synoptic Gospels — they all give roughly the same synopsis of Jesus’ life. Since the most miraculous events of Jesus’ life come at the beginning and end — the virgin birth and the resurrection, respectively — I figured that, were I to compare the Synoptic Gospels, I’d find the most glaring contradictions among the Gospels there. And I wasn’t disappointed: the middle portions of the Synoptics are largely a combination of teachings and events, and except for the ordering of events — and it was a common technique of historians in those days to order the events of a person’s life for narrative effect rather than rote accuracy — you don’t really see any contradictions or glaring differences in the accounts. But the beginnings and the endings of those Gospels do differ widely. In this post I’m just going to focus on the endings — the Synoptic Gospels’ accounts of Jesus’ resurrection. Comparing these three Gospels’ resurrection accounts, a common narrative thread does appear: A number of women arrive at Jesus’ tomb and find it empty. They encounter one or two angels who inform them that Jesus is risen, and they are instructed to tell Jesus’ disciples the good news. The accounts in Mark and Luke are similar enough to suggest that one was derived largely from the other. I say this primarily because Mark 16:12-13 — “After that, He appeared in a different form to two of them while they were walking along on their way to the country. They went away and reported it to the others, but they did not believe them either” — seems to be a quick summary of the “Road to Emmaus” account in Luke 24:13-35. Matthew, on the other hand, makes no mention of the “Road to Emmaus” account, but what Matthew does make mention of — what doesn’t appear at all in the other two Synoptics (or in the Gospel of John, for that matter) — is a doozy. And it can be summed up in one word: Guards. Now on the next day, the day after the preparation, the chief priests and the Pharisees gathered together with Pilate, and said, “Sir, we remember that when He was still alive that deceiver said, ‘After three days I am to rise again.’ Therefore, give orders for the grave to be made secure until the third day, otherwise His disciples may come and steal Him away and say to the people, ‘He has risen from the dead,’ and the last deception will be worse than the first.” Pilate said to them, “You have a guard; go, make it as secure as you know how.” And they went and made the grave secure, and along with the guard they set a seal on the stone. Now after the Sabbath, as it began to dawn toward the first day of the week, Mary Magdalene and the other Mary came to look at the grave. And behold, a severe earthquake had occurred, for an angel of the Lord descended from heaven and came and rolled away the stone and sat upon it. And his appearance was like lightning, and his clothing as white as snow. 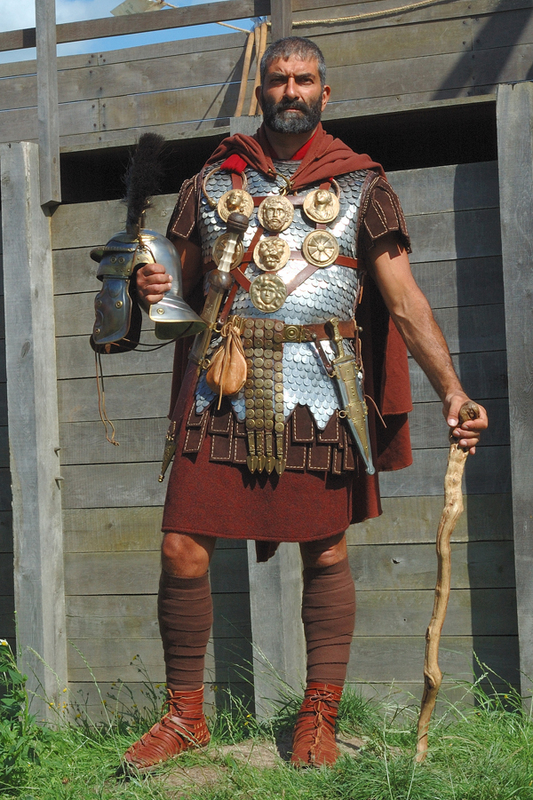 The guards shook for fear of him and became like dead men….some of the guard came into the city and reported to the chief priests all that had happened. And when they had assembled with the elders and consulted together, they gave a large sum of money to the soldiers, and said, “You are to say, ‘His disciples came by night and stole Him away while we were asleep.’ And if this should come to the governor’s ears, we will win him over and keep you out of trouble.” And they took the money and did as they had been instructed; and this story was widely spread among the Jews, and is to this day. Now, I’ve heard it said by skeptics that no Roman guard would have taken a bribe in this way, as it would’ve meant death for them all. I don’t care about all that. What I do care about is that nothing about guards appears in any of the other Gospels. Nothing. Not only is there no mention of guards fainting dead away at the opening of Jesus’ tomb, but there’s no mention of guards being appointed at all. And what’s crazy about that is that this guards thing makes for such an exciting scene! You can almost picture it like a Michael Bay movie playing out: The guards standing around, probably bored out of their skulls and wondering what they did to deserve such a ridiculous assignment. Maybe they were cracking jokes about the tomb’s occupant. And then, BOOM! An earthquake! An angel descends like a flash of lightning! The guards fall, frozen and shaking! The angel rolls the stone away! 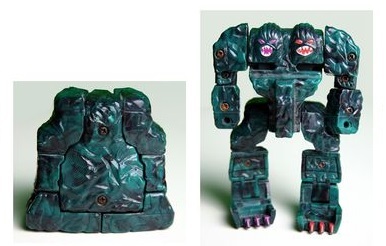 Then the stone transforms into a sweet robot. That’s entertainment, people! So why on earth would you leave this exciting stuff out? Now after the Sabbath, as it began to dawn toward the first day of the week, Mary Magdalene and the other Mary came to look at the grave. And behold, a severe earthquake had occurred, for an angel of the Lord descended from heaven and came and rolled away the stone and sat upon it. And his appearance was like lightning, and his clothing as white as snow….The angel said to the women, “Do not be afraid; for I know that you are looking for Jesus who has been crucified. He is not here, for He has risen, just as He said. Come, see the place where He was lying. Go quickly and tell His disciples that He has risen from the dead; and behold, He is going ahead of you into Galilee, there you will see Him; behold, I have told you.” And they left the tomb quickly with fear and great joy and ran to report it to His disciples. And behold, Jesus met them and greeted them. And they came up and took hold of His feet and worshiped Him. Then Jesus said to them, “[cDo not be afraid; go and take word to My brethren to leave for Galilee, and there they will see Me.”. So how is it that Mark and Luke didn’t include anything in their resurrection accounts about guards being posted at Jesus’ tomb? It seems that either they must not have known about the guard account, or else they didn’t find the account credible enough to include in their gospels. If the former reason is correct, and Matthew didn’t draw the guard account from commonly-known stories about Jesus, then what was Matthew’s source for it? Or, if the latter reason is correct, why did Matthew feel the need to include this guard account while Mark and Luke gave it a hard pass for being less than credible? Whichever reason turns out to be the case, the last line of the guard account provides the answer to our questions. It appears the whole purpose of Matthew’s inclusion of the guard account is to rebut a popular Jewish argument against Jesus’ resurrection — a Jewish argument that depended on there being guards at Jesus’ tomb. The audience whom Matthew was trying to convince of the validity of the Gospel must have been aware of the Jews’ argument — because of Matthew’s extensive use of Old Testament prophecies throughout his Gospel, it’s generally believed his intended audience were Jews themselves — which meant that argument had to be explained away somehow. So Matthew did what any good apologist storyteller would do: He incorporated their argument into his Gospel account, and then he “disproved” it. Why do none of the other Gospels contain the guard account? Because the guard account doesn’t come from any commonly-received material about Jesus. Rather, the guard account is derived from a Jewish argument against Jesus which was known to Matthew’s intended audience, and none of the other Gospel authors had audiences contending with this specific argument. So it turns out that a large portion of Matthew’s resurrection account is sourced from anti-Jesus material. Huh. But there’s still another problem with Matthew’s resurrection account. And behold, Jesus met them and greeted them. And they came up and took hold of His feet and worshiped Him. Then Jesus said to them, “Do not be afraid; go and take word to My brethren to leave for Galilee, and there they will see Me.”. Doesn’t that second paragraph seem to intrude upon the narrative? 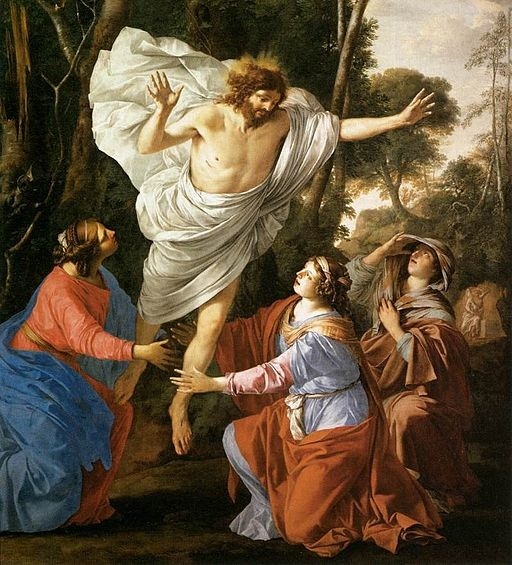 The women arrive at the tomb and find it empty, and the angel tells them to go to Jesus’ disciples and tell them to go to Galilee where they will see Jesus. So they do — they’re on their way, mission progressing nicely. And then, out of the blue, Jesus shows up. And he gives them the exact same instructions. Why? What was the need? Were the women starting to doubt what they’d heard, so that they needed a faith boost? Now after the Sabbath, as it began to dawn toward the first day of the week, Mary Magdalene and the other Mary came to look at the grave. And behold, a severe earthquake had occurred, for an angel of the Lord descended from heaven and came and rolled away the stone and sat upon it. And his appearance was like lightning, and his clothing as white as snow. The guards shook for fear of him and became like dead men. The angel said to the women, “Do not be afraid; for I know that you are looking for Jesus who has been crucified. He is not here, for He has risen, just as He said. Come, see the place where He was lying. Go quickly and tell His disciples that He has risen from the dead; and behold, He is going ahead of you into Galilee, there you will see Him; behold, I have told you.” And they left the tomb quickly with fear and great joy and ran to report it to His disciples. The two missing verses, 9 and 10, would normally come between the first two paragraphs. Without them…well, it doesn’t feel like there’s anything missing at all — verse 8 flows nicely into verse 11. The narrative reads like a complete unit, no gaps. But if someone felt the need to insert verses 9 and 10, then something must be missing here — some critical piece of information that these verses supply that the unaltered text lacks. What could that be? What does the women’s taking hold of Jesus’ feet do? It proves Jesus had risen bodily, right? That he wasn’t just a spirit floating around — something people could see but not touch? Now go back and read Matthew 28 again without verses 9 and 10, and ask yourself this: Is there anything in there that would otherwise tell you that Jesus rose from the dead in his body? Quite the opposite, don’t you think? And why is that? Mostly because of the guards. Think about it: You’ve got a whole bunch of guards surrounding the tomb. They all see an angel descend from heaven like lightning and roll the stone away from the tomb. But what didn’t they see? They didn’t see Jesus leave the tomb. There was nothing in their report to the chief priests and elders about a risen Jesus walking out of the tomb under his own steam. The women didn’t see Jesus leave the tomb, either. All the angel showed them was an empty tomb. So you’ve got a sealed tomb with a body in it. Then you open the tomb, and there’s no body inside. What happened to the body? Did God destroy it? Did God turn Jesus into a non-corporeal spirit? Did Jesus ever really have a body at all? These were serious questions back in New Testament times. One of the major heresies that the early Christians combatted was the idea that Jesus never really possessed a human body. In fact, one reason the Gospel of John contains such statements like, “And the Word became flesh” (John 1:6) is that it was written in part to combat this heresy. 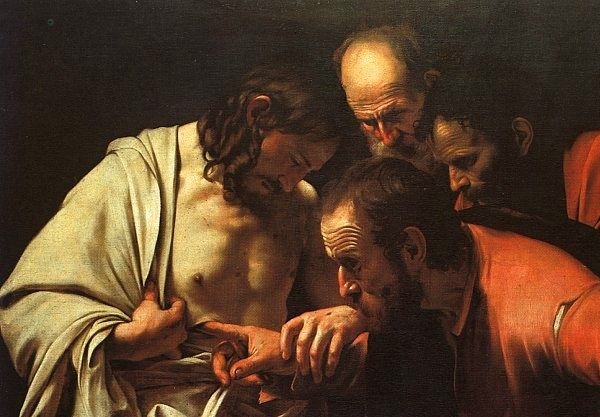 That heresy is also responsible for history’s most famous unsanitary wound inspection. 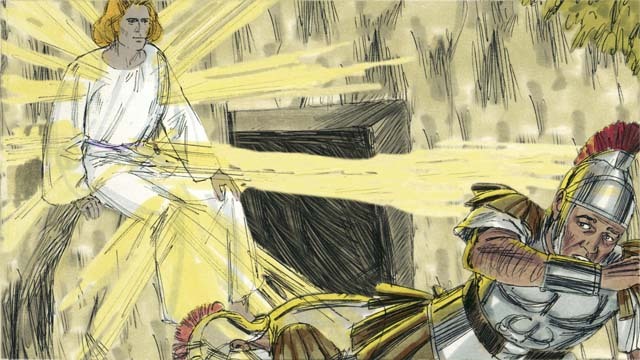 And now, along comes Matthew, thinking he’s cleverly taken care of the “guard rebuttal” that the Jews were throwing at him, only to discover — assuming it was he, and not a later redactor, who discovered this — that in putting guards at the empty tomb he’d created an opening for “bodiless Jesus” heretics not supplied by the other gospels (all of which have no one but angels in attendance for the removal of the stone sealing the tomb). How to fix this new problem? Add verses 9 and 10, clumsy though they make the overall narrative sound. Have the women grab some feet and prove a body. 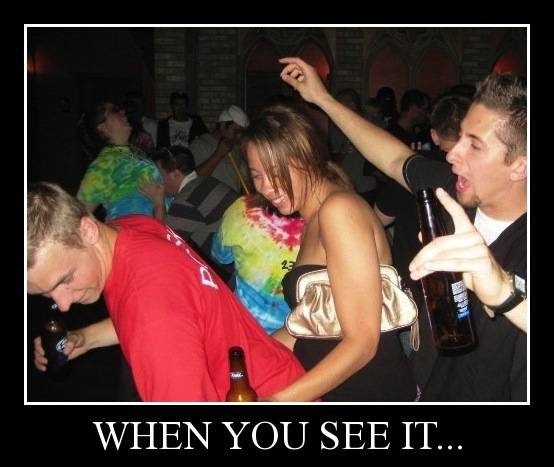 There’s an old meme called “When You See It”, where you’re given a photo that usually looks pretty mundane, but once you’ve spotted a particular detail, the picture shifts from mundane to hilarious (or maybe horrifying). And you can never go back to seeing the picture the way you first did. Keep looking. It took me a minute. In the same way, my feeling is that once you’ve seen the gaping flaws in the Gospel of Matthew’s resurrection account, you’ll never go back to thinking it’s anything but garbage.